This chapter highlights qualitative findings from two field studies that focused on supporting people with sleeplessness (Study 1) and moderate depression (Study II). Both the studies were designed to examine the prospective impact of reminders and rehearsal on the effectiveness of web- based eHealth interventions. The interventions were incorporated with Acceptance and Commitment Therapy. In this chapter, qualitative findings are reported with an aim to highlight issues that are at times overlooked. Further, the findings are expected to help researchers better understand eHealth interventions for mental health care. Results from the two studies uncover interesting contrasts. While the participants of the Study I (Sleeplessness) generally did not find reminders to be helpful, on the contrary, the participants of study II (Moderate Depression) largely approved reminders especially in terms of task completion. In terms of rehearsal, participants from both the studies approved the virtual exercises in terms of learning desirable self-help behaviors. Finally, the chapter highlights some of the grey areas in the field of eHealth interventions for mental health care. The identified grey areas are expected to create opportunities for further research and advances in the field of mental health care. A relatively under-studied area in the field of Mental Health Care is identifying the factors that contribute to continuous use of eHealth interventions for mental health care. In order to design and implement effective interventions, it is important to gain a richer insights about users’ perspectives with a special focus on areas such as User-system feedback, Online support, Use of Reminders or prompts, Content of the interventions, Trust and Privacy. Despite bulk of published literature about Internet- and Mobile- based interventions for mental conditions, it appears that there is a lack of transparency as well as unified understanding on the part of system developers as well as researchers (Barak et al. 2009). In recent years, most of the studies in the area of mental health care have focused on areas such as adherence (Kelders et al. 2012), dropouts rates, perceived benefits (Drozd et al. 2012) and persuasiveness of eHealth interventions. Further, the overlap in terminologies as well as imprecise narratives (Langrial et al. 2012) have caused the field to become rather diffused and unnecessarily complex. 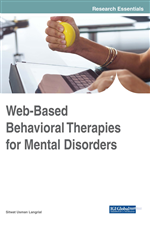 Yet another issue in the area of mental health care is that there is more focus on technological aspects while designing the interventions and overlooking the significance of incorporating psychological content. Technological advances have opened new opportunities to develop Internet- and Mobile- based Interventions that can support people suffering from mental conditions including but not limited to depressive symptoms, mild depression, acute depression, hypertension, stress, anxiety, trauma and sleeplessness. Both Internet- and Mobile- based interventions have shown promising results in supporting people with several mental conditions (Mohr et al. 2013). We propose that Internet- and Mobile- based eHealth interventions for psychological betterment is a step farther from more traditional behavior change interventions. Behavior change interventions have been studied and categorized differently; for example, Persuasive Technologies (PT), and Behavior Change Support Systems (BCSSs) (Langrial, 2012). However, we propose that designing an eHealth intervention is perhaps the easier part! The real challenge is to continuously monitor an intervention and make needed improvements by identifying the actual needs of users. In addition, involving users or in some cases their immediate caregivers would certainly help in re-shaping the very paradigm of Internet- and Mobile- based interventions for mental health care. Information systems that are developed to support behavior and/or attitude change are often studied as digital interventions (Langrial, 2012). We cautiously argue that labeling behavior change technologies as digital interventions is a holistic approach. Research on eHealth interventions dates back to the early 90s where they were predominantly used for preventive medical area mostly through intermediations (paper- based and/or telephonic calls). A large number of studies have been carried out that aim to intervene health- related behaviors. For instance, Revere and Dunbar (2001) highlight that personalized digital interventions are moderately effective. Similarly, Langrial et al. (2014) propose that digital interventions have shown promise in supporting people’s behavioral change process.